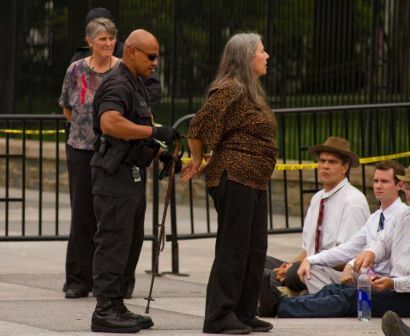 The Tar Sands Action brought together more than 1200 people from all over the country to demonstrate the intensity of their opposition to the tar sands pipeline by risking arrest in front of the White House; thousands more supported the civil disobedience. What was it like to put our bodies into predictable discomfort in order to make a principled statement? Was it worth all the time and money we invested? Join the discussion of these questions this Friday evening in Jamaica Plain (see the calendar for details). What surprised me in the action was not the efficient, courteous, and at times humorous way that the police and demonstrators acted out their roles in this familiar dance of civil disobedience in front of the White House. The actual arrest was almost painless. Mercifully, the clouds kept us from broiling on the sidewalk and in the van. Linda, a Toronto woman with a beautiful voice, lead us in the first chorus of “America the Beautiful” as the police drove us away from the White House. Mary, a Quaker from metro Boston, shared with us the third verse of that song, one that echoed much of our feelings about democracy at that moment. I shared an old chestnut from the feminist anti-militarist movement. From sidewalk to release from Anacostia Detention Center, we spent less than 3 hours in custody. Catherine, a DC friend who’s been fighting for justice since before I met her in the early ‘80s, managed to persuade the police to release her despite the fact that she didn’t have the funds we were asked to forfeit. And thanks to the financial support of many friends and allies, we were able to cover the costs of transportation and fines for three people who would have had to struggle to bear those burdens alone. What did surprise me was the call for environmentalists to consider the President’s upcoming decision on the pipeline to be a “line in the sand,” that would determine whether or not we “greens” would volunteer for the campaign to win Obama’s second term. Certainly, our anger was exacerbated by the announcement that the President had caved to industry pressure and rejected the EPA’s proposed tightening of smog pollutants. But as one friend who’s a government employee pointed out to me, Obama has very little room in which to maneuver if he wants to keep government functioning enough to prevent more brinksmanship and economic peril. He’s damned in public opinion whichever way he goes; and his detractors distort and lie about his motivations and the consequences for the rest of us. We can’t stand in his shoes, but we can act as allies by sticking with our principles and criticizing his capitulations, continuing to pull what Chomsky calls the “spectrum of debate” toward sustainability and justice. Of course our efforts may have produced the political equivalent of only a whisper: an earnest, outraged rush of wind trying to find its way to the President’s ear through the braying of lobbyists, party hatchet men, and other power mongers. But our collective whisper is also undoubtedly a sign of hope, not unlike the egret I saw in northern New Jersey’s toxic wetlands as I passed by on the train home from Washington, DC. Like the egret determined to find sustenance in an industrial wasteland, our actions represented the determination of each generation to make the world a better place for the next. The protest’s demand to protect our planetary home from rapacious greed was made loud and clear to all those who would listen. By the end of the year, we’ll know whether the President heeded our warning. This action was a beginning, not an end. In meeting old and new friends from Canada as well as the US, we laid foundation stones for a movement to fight this pipeline through every state, province, and county endangered along its proposed route. We’ll boycott and pressure corporations in order to starve the tar sands exploiters of their markets and investors. We’ll picket the banks and the gas companies that fund this destruction. We’ll testify at the EPA hearings in DC and sit-in at the border when the oil profiteers prepare to clear-cut and bulldoze the pipeline’s path. And, we’ll work with allies in labor unions, environmental racism organizations, and indigenous communities to build the power of our demands from a whisper to a roar. Previous Article Stop the Tar Sands Pipeline!